Hello all and welcome to Words and Pictures! 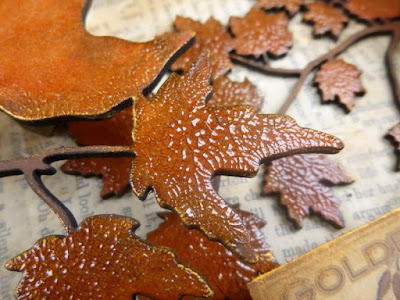 Thank you so much for your lovely comments on my frosted bottles at PaperArtsy and the winter branches at Calico - very much appreciated, especially since I haven't been able to hop around as much as I'd hoped this week... roll on the weekend for some blog-visiting!! We have at least made it to Friday... and it's another Tag Friday over at A Vintage Journey - that lovely extra Friday in a challenge month which means we all just get to play with tags, Tim-style! If you head over to A Vintage Journey you'll find a wealth of beautiful tag-making from my fabulous team mates, and here's my offering. You'll see I've been reworking ideas from recent projects... it's a combination of my Art Journalling With Tim pages (there's still nearly a week to play along with my Art Journalling with Tim challenge) and my Wilted Violet Moments tag. I guess I'm still working through my unexpected love of Wilted Violet as an autumn colour! 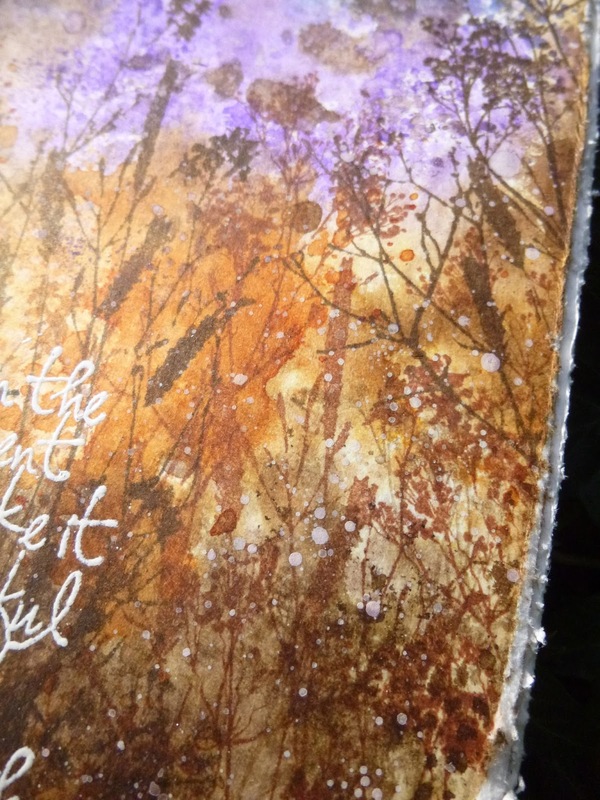 The colours are a direct lift from my journalling pages... so there's Chipped Sapphire, Wilted Violet, Rusty Hinge and Ground Espresso all smooshed onto the jumbo tag and re-smooshed for a wrinkle-free distress look. As far as the images go, I've pretty much CASEd my own tag but in a larger version. So there are wild meadow grasses layered on to the lower part of the tag, stamped in Sepia and Coffee Archival as well as Ground Espresso and Vintage Photo Distress inks. Generally the paler the colour the further away the image looks, so you can create quite a lot of dimension without trying to use masking, which would be nigh-on impossible with images this intricate. It's helpful that foreground colours tend to be more intense, because obviously the darker inks take precedence over the lighter ones visually, so they do appear to be "in front". Up above, the birds are gathering ready to set off on their migratory journey. Unusually for me, every single stamp used on this tag is a wood-mounted one. I don't have many (too space-consuming), but the ones I have are some of my all-time favourite images. This word stamp, for instance, is a constant go-to sentiment. I've embossed it in Vanilla White to make sure it holds its own against the colourful and detailed background. There's a rustic topping, and plenty of chalky white splatter too, just to give a lift to the look of the whole thing. By mounting the tag on some ivory watercolour card, you get a pale frame which draws together the lighter highlights on the tag. But watch out... by the time it was mounted, the jumbo tag only just fitted in to the intended standard envelope! 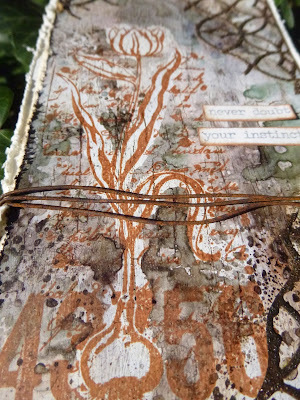 I added some complementary stamping and white splatter on the front and popped it all in to the post. I know it has safely reached its destination so I'm happy to share it with all of you as my Tag Friday contribution. Do hop over to A Vintage Journey to see what my fantastic team-mates have been creating, and I hope you'll get a bit of creative playtime soon too. 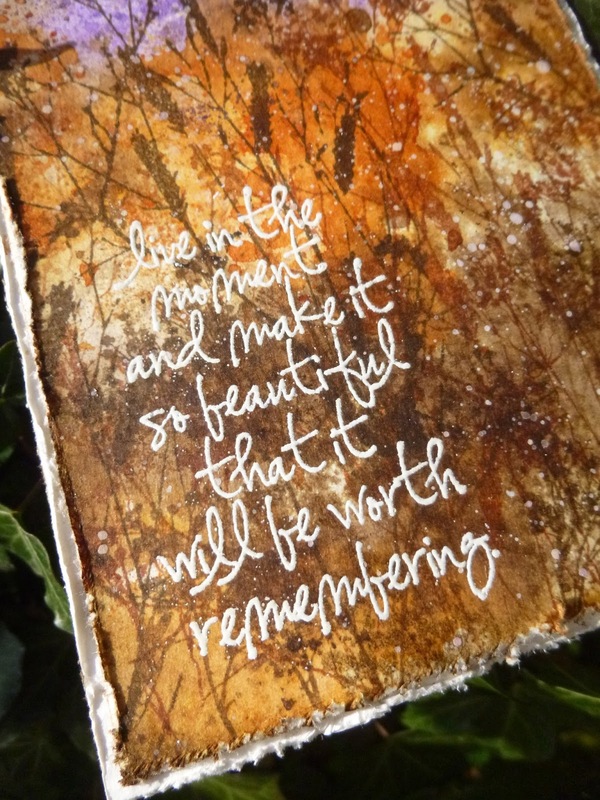 There are even a few days left to try out some Art Journalling With Tim if you fancy a challenge. 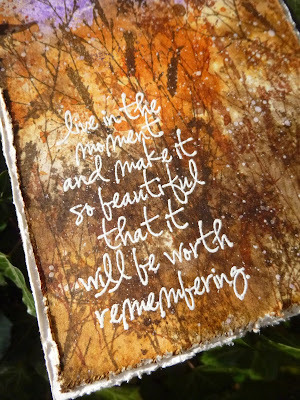 I hope you all have a beautiful weekend worth remembering! Happiness, not in another place but this place... not for another hour, but this hour. "My favourite day," said Pooh. Hello all and welcome back for the second sneak peek of the day. I'm here now to send you hopping mad again! The new theme over at PaperArtsy for this fortnight is Triptyches. I haven't had time to offer inspiration there for a while but given that I often seem to end up working in triplicate - usually by accident as much as by design - I couldn't miss this one! I'm back with my bottle obsession and I've been playing with the new Frosted Glaze for this one, trying to create vintage embossed glass out of pretty much nothing. 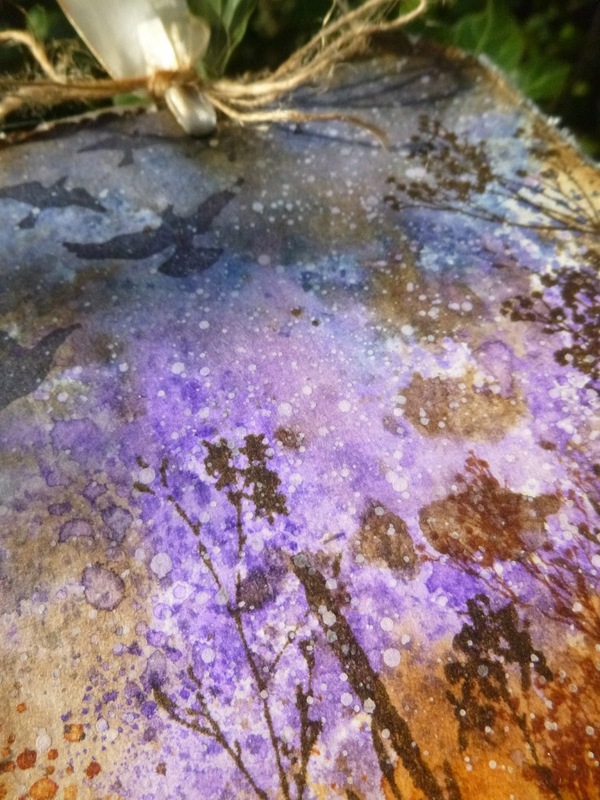 If you hop over to PaperArtsy to take a look, watch out for the midnight weeds, distilled into the poison bottles, thrice blasted, thrice infected (a triple infection - appropriately for a triptych!). 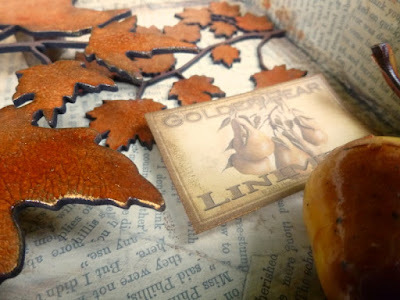 Thanks so much for stopping by and hopping around today, maybe twice... if you missed my Winter Branches over at Calico, do take a look. 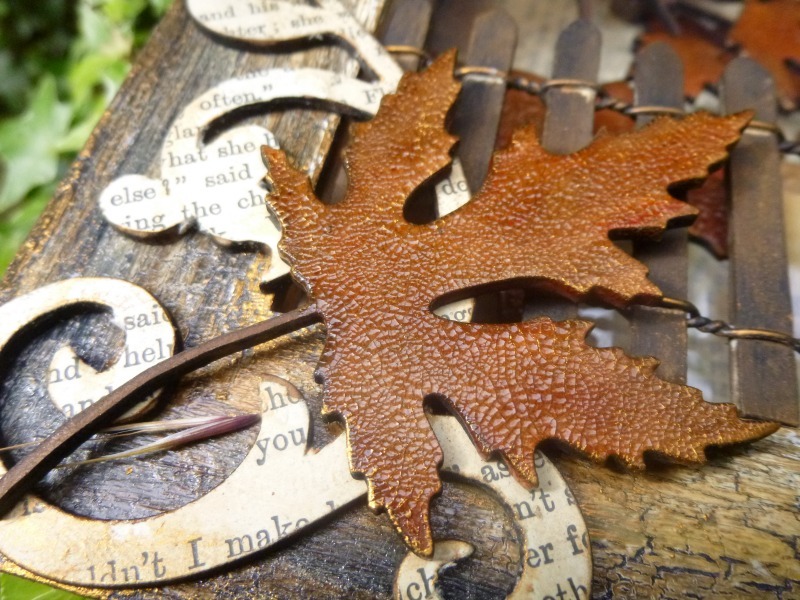 I'll be hopping around Craftyblogland in between workshops and train travel this week, so I'll hope to see you soon. 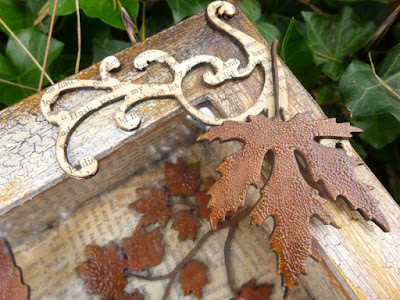 is being featured over at Scrapbook Expo this week - I'm very honoured, thank you Lorraine. Hello all! Apologies for my absence around Craftyblogland lately - it's just been a very busy time again. All being well, I'll have been able to do some Sunday visiting to see what you've all been up to. And after a quiet-ish week or so, it's a double-hopping day today at Words and Pictures. Here's the first leap for you to take... 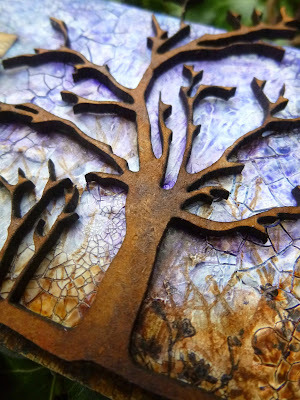 I'm over at the Calico Craft Parts blog with a crackly ATC celebrating the beauty of trees. It would be great if you have time to hop over and take a look. I'm still playing with my new fancy for purple - inspired by Wilted Violet - but this time using DecoArt paints rather than Distress Inks. I'll be back this evening with another offering, so I'll hope to see you again soon either here or elsewhere in Craftyblogland! Nor for the red at dawn. 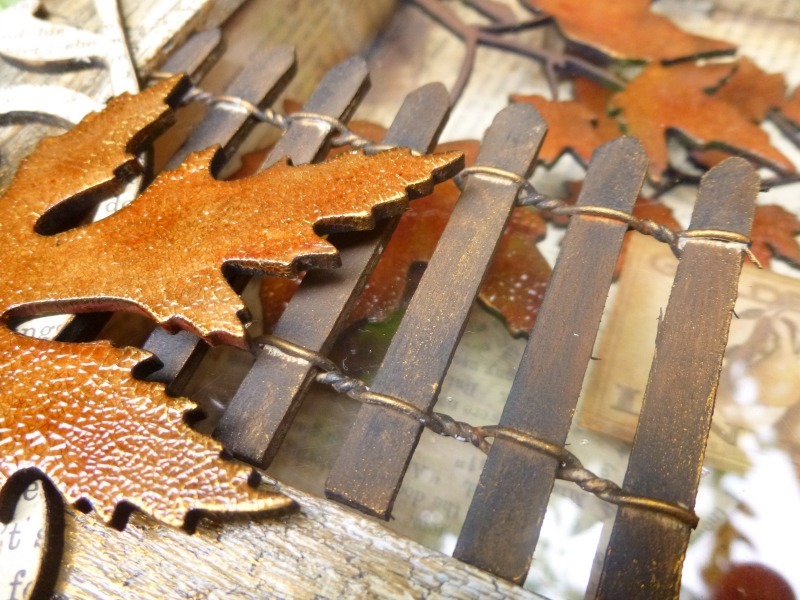 I'm glad you enjoyed the recent tower of Autumnal ATBs over at Calico Craft Parts. 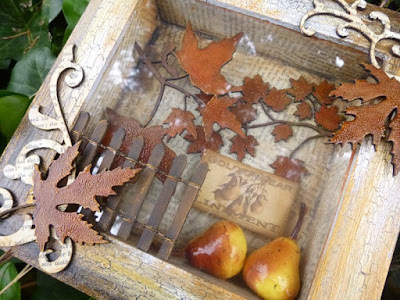 This shadow box uses some more of those fabulous leafy shapes - I can't get enough of them! 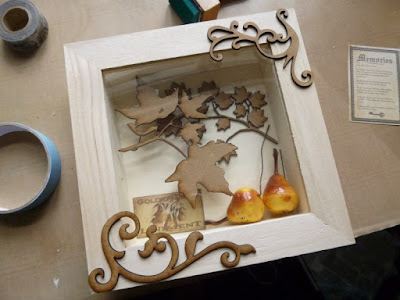 I used several of the leaf designs and layered them in and on a shadow box frame to create a sense of dimension and depth. I know none of them are leaves from a pear tree, but those golden pears were just crying out to be a part of the whole thing. 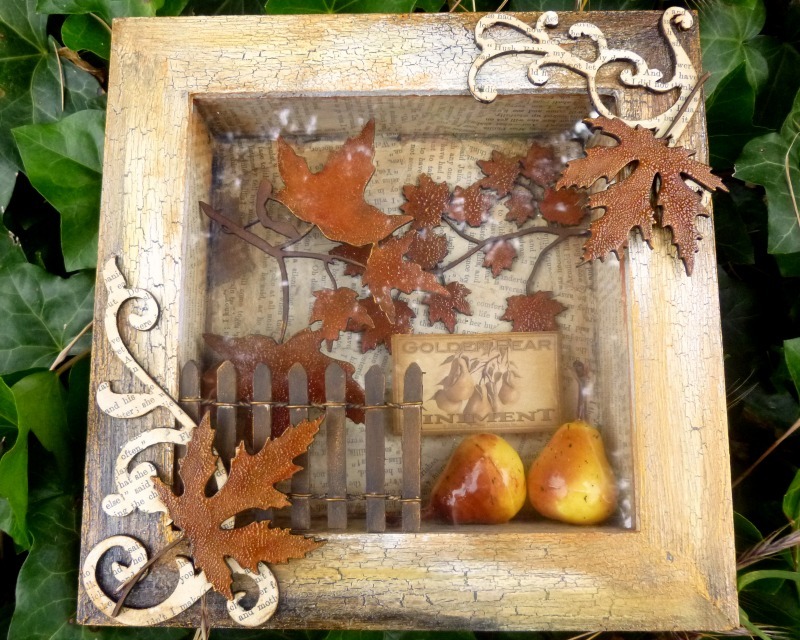 The box itself is an Artemio Square Wood Shadow Box Frame, 15 x 15cm and just under 4cm deep. 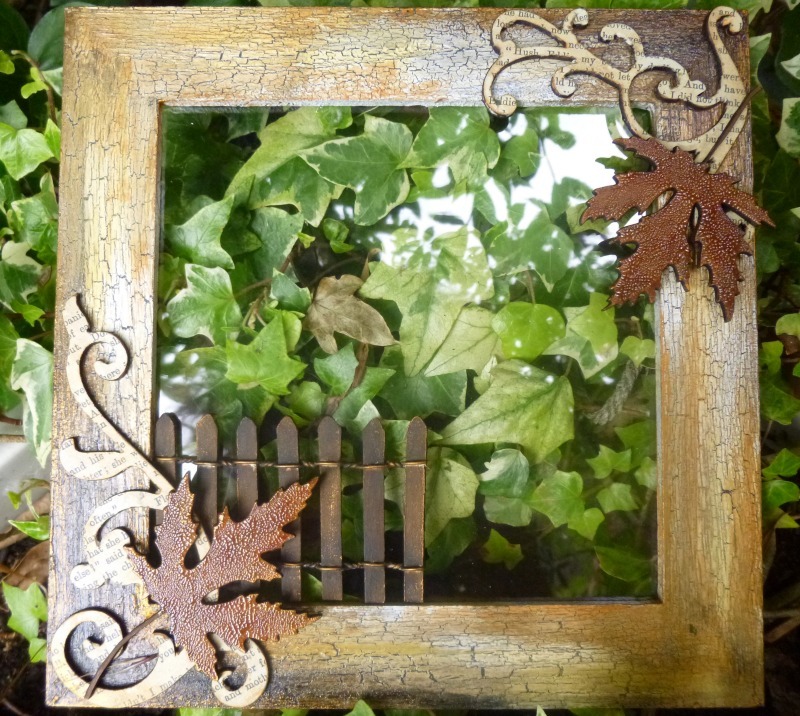 It has an acetate cover, which I ended up keeping in the box, because I wanted to use it to add another layer of dimension with the fence, but you could equally well leave the front open. 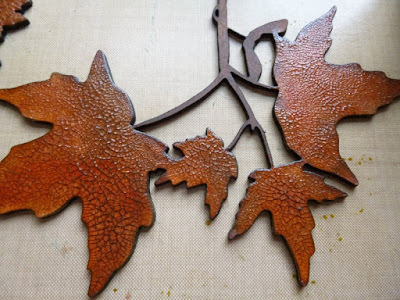 At first, I'd thought of leaving the leaves unaltered - they really are lovely even in their raw state, but as the background progressed I decided to take a leap and got out the paints. 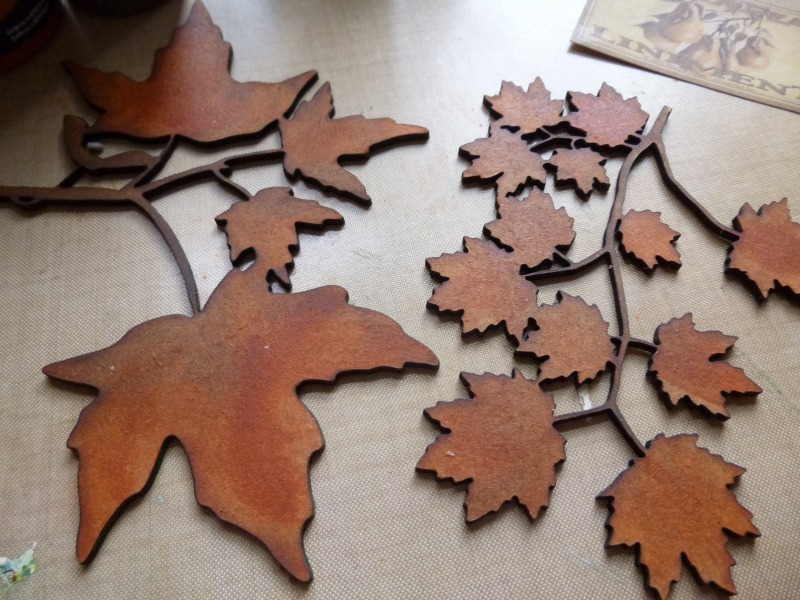 I started with the Mini Sugar Maple Leaves - being small, I thought they could be the furthest away, on the back wall of the box - and then the larger Sugar Maple Leaves would be in the foreground. 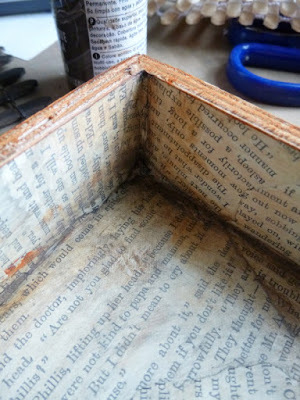 The background is formed of lots of torn book pages glued down. 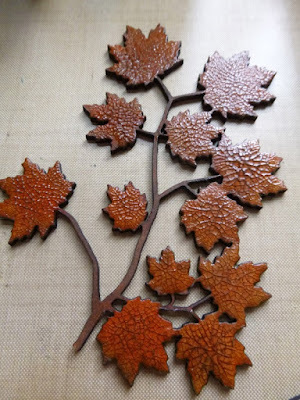 Once the glue was dry, I started adding shading using various DecoArt paints - Burnt Sienna, Lamp Black, Raw Umber, Transparent Red Iron Oxide and Quinacridone Gold. The colours built up to a nice depth, and it was then I realised the leaves needed a bit more oomph, so I applied those last two (you don't want me to type out those huge long names again, surely?! T.R.I.O. and Q.G. - that'll do, won't it?) direct to the surface, and used a bit of Raw Umber for extra shading. ... and with some dark ink applied and wiped away, I get even more of a kick out of it. 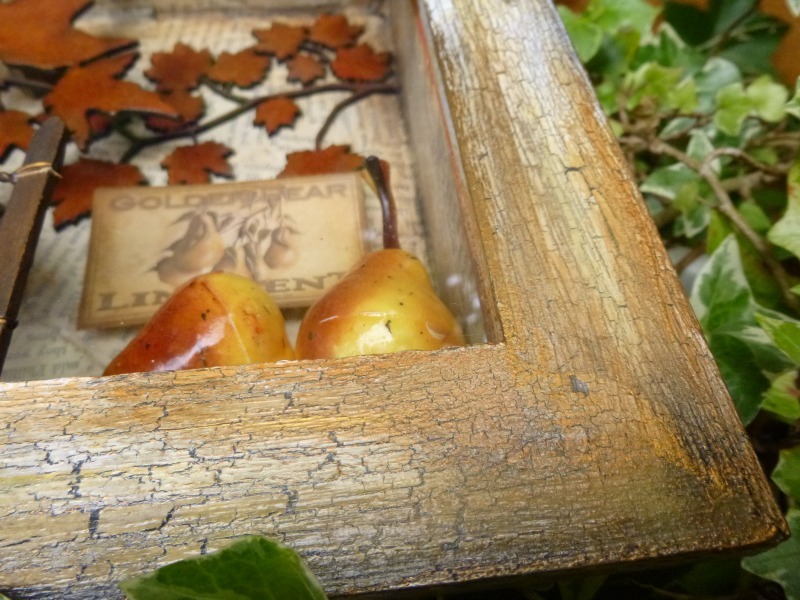 For a finishing touch, I added just a hint of Florentine Gold Treasure Gold Gilt Wax around the edges - subtle, but great in the sunlight! I'd had my eye on them on the Shiny Yellow Pears for a while, but stupidly hadn't read the measurements, so they were larger than I was expecting - beautiful, though, and perfect for this box. 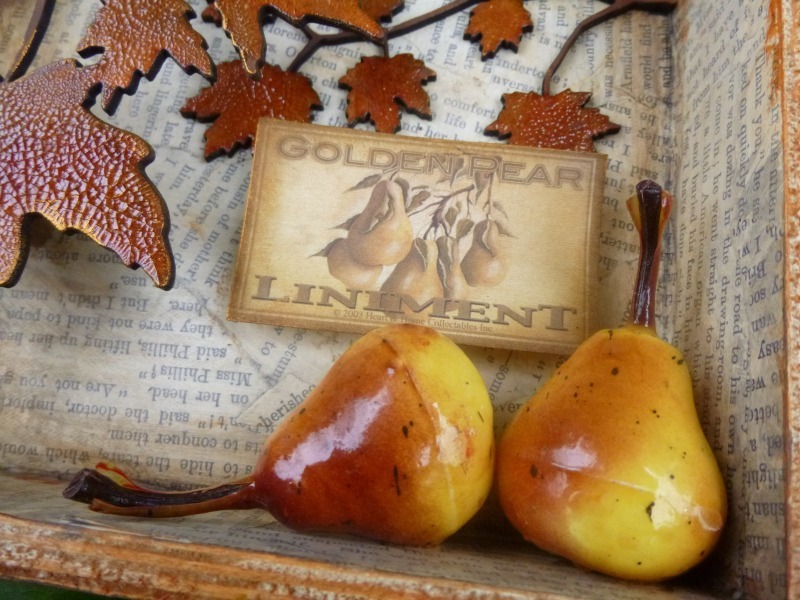 And the little Golden Pear Liniment label is part of a line of Vintage Labels which has sadly ceased production. It's mounted on a double layer of padded tape to create another level of dimension. 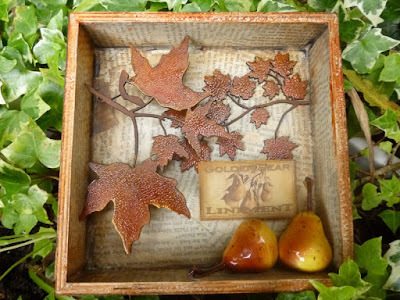 ... with lots of dimension created by mounting the large leaves on some more of my cut-up foam packaging sponges. I needed to start tackling the frame. I started with a coat of the dark grey Relic Chalky Finish Paint by DecoArt, and then added a layer of the Americana Decor Crackle Medium (specially formulated to work with the chalk paints). Once that was dry, I used Everlasting Chalky Finish Paint (the soft white) as my top coat and watched the magic happen. I then started adding some shading, using the same collection of paints as on the interior of the box (yup, including T.R.I.O. and Q.G. of course!). I added in some Spicy Mustard (another DecoArt Americana colour) too, to pick up the yellow of the pears. 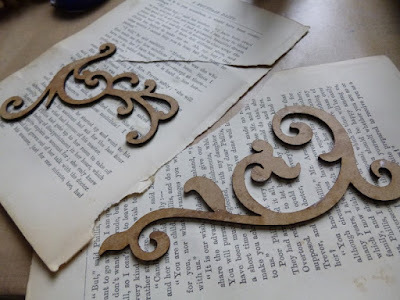 And I used a lot more Raw Umber and Lamp Black in the corners where I planned to put the flourishes, so that they would stand out against the darker shadows. I sealed it which also adds a bit of a sheen. 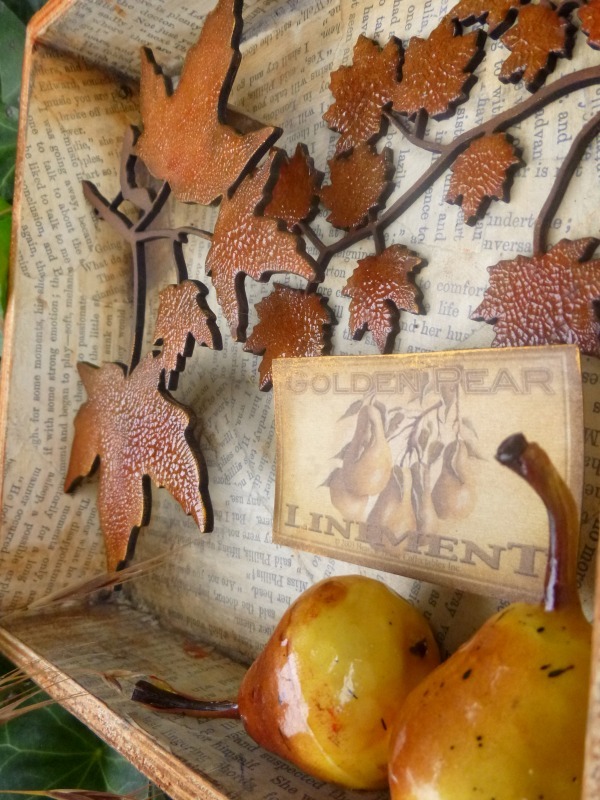 The final touch was to add some Florentine Gold to highlight some of that texture from all the paint layers, and echo the golden pears and leaves. ... and the Large Vine in the bottom corner. I thought I'd cover them in book pages to echo the interior. 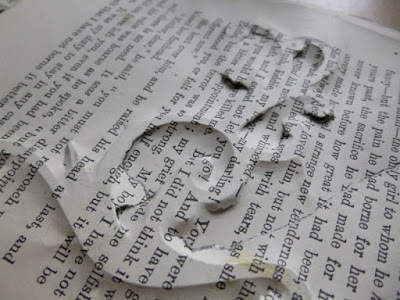 I stuck them to the pages and then pressed down hard around the edges to start getting rid of the paper. I used an emery board to sand away most of it, always sanding downwards so as not to risk the pages peeling upward. And in the really fiddly bits I occasionally employed my tiny scissors to get right into the corners. Once they were ready, I applied some washes of paint to tone with the papers on the inside of the box. When I laid the flourishes in place, I realised it needed something else... so I grabbed some more leaves - this time the Maple Leaf and Twig (probably my favourite of them all). 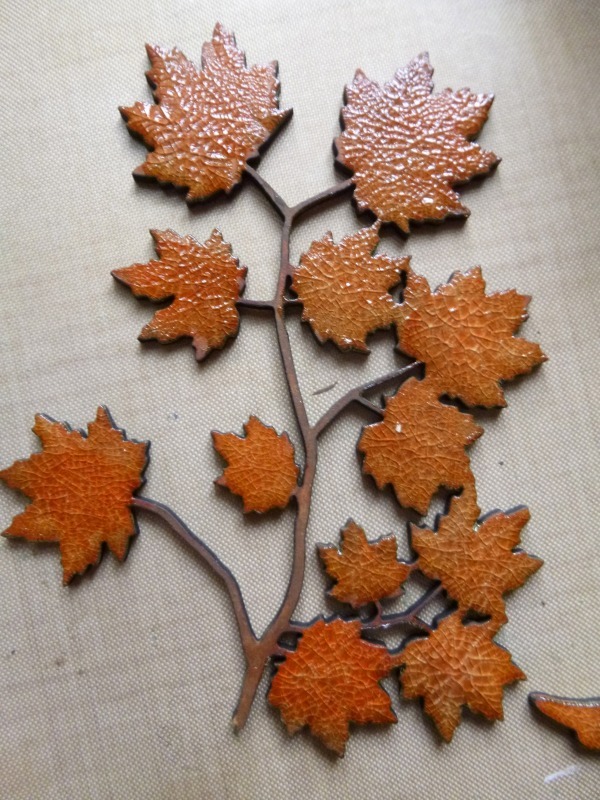 I cut it so that I had two individual leaves, and then gave them the same treatment as the leaves on the inside. So now there are three layers of depth to my leafy Pear-Maple orchard! I realised that with the acetate in the frame, I had the opportunity to add yet another layer, and grabbed some of the Natural Wood Picket Fence I got ages ago. I painted it with Raw Umber, dry-brushed some Lamp Black over that, and finished by highlighting it with some more of the Florentine Gold - especially on the wires - to tie it in with the rest of the colour scheme. The acetate makes it a bit difficult to capture the piece on film without strange shadows and reflections, but it's worth it I think to get that fence in place - and the naked eye can cope much better with the lighting problems. I even quite like just the frame by itself, especially framing my beloved ivy!! Thank you so much for your company through yet another mammoth post... I'm really going to try to practice economy in future. I need to make simpler projects, I suppose. Hope you enjoyed this autumnal catch-up. I'm hoping to do some catching up myself around Craftyblogland in the next few days, and I'll be back on Monday with a double helping of new creations to share. See you soon! 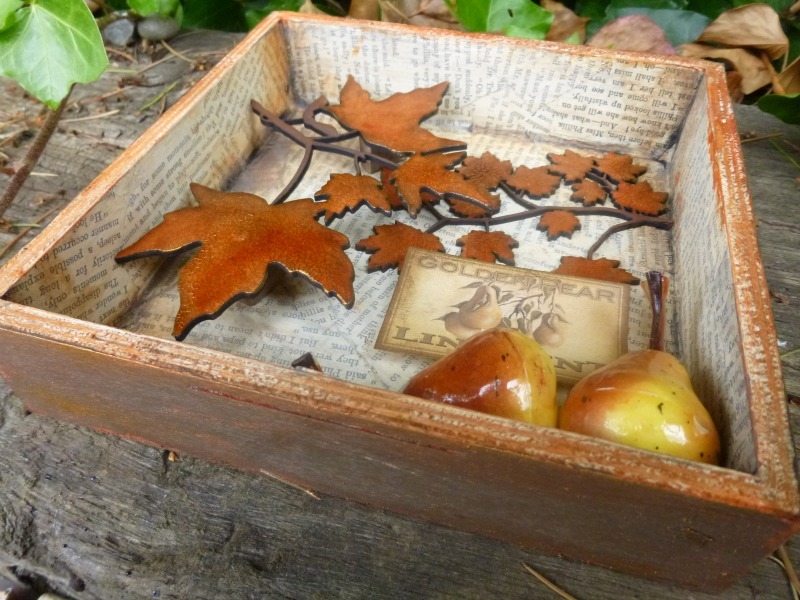 Hello all, I'm so glad you enjoyed the Autumnal ATBs over at Calico Crafts. Today I'm back with my second piece for Country View Challenges this month, hoping to inspire you to Add Some Texture. 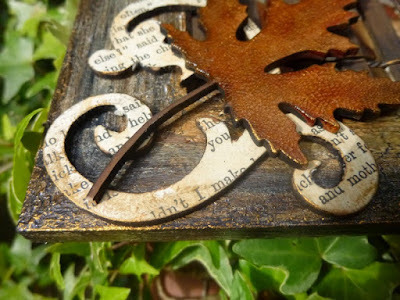 I'm always adding some texture, so I loved Jennie's challenge this month. From the many fantastic entries rolling in, it seems you do too! 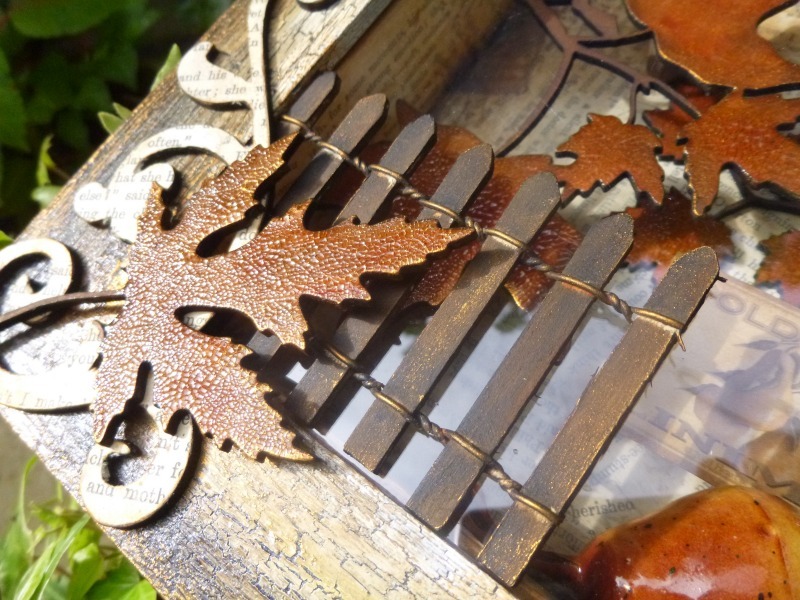 There's been lots of extra inspiration over at the Country View Challenges blog all month, and there's still plenty of time to play, so do come and get textural with us. My second offering continues in the autumnal atmosphere which has been hovering over Words and Pictures lately, and this time I've gone really earthy. Ground Espresso is responsible really - it's such a rich, dark, earthy colour and it plays the starring role here. I don't seem to have any process photos for this one - I was just playing and not really thinking it would go anywhere I think - but it's pretty simple. 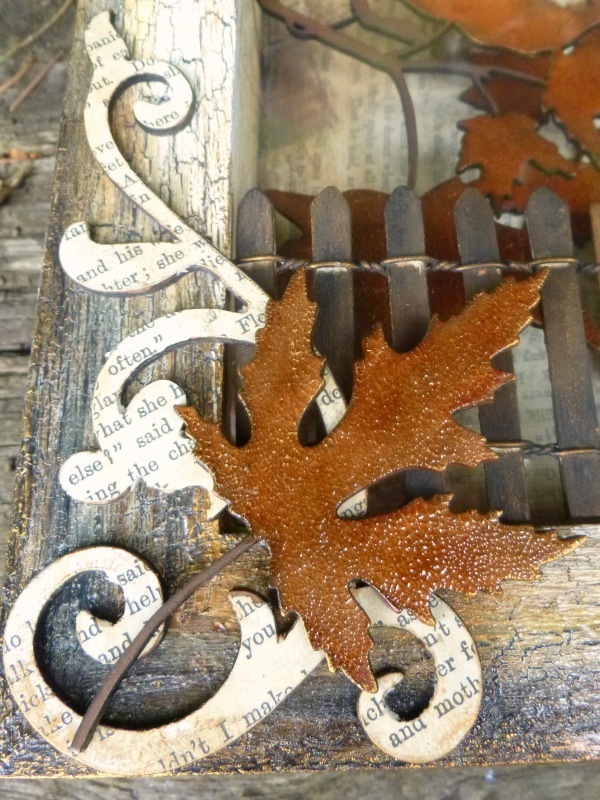 I started with one of my favourite backgrounds... a PaperArtsy Fresco weathered crackle with French Roast (good for Ground Espresso! 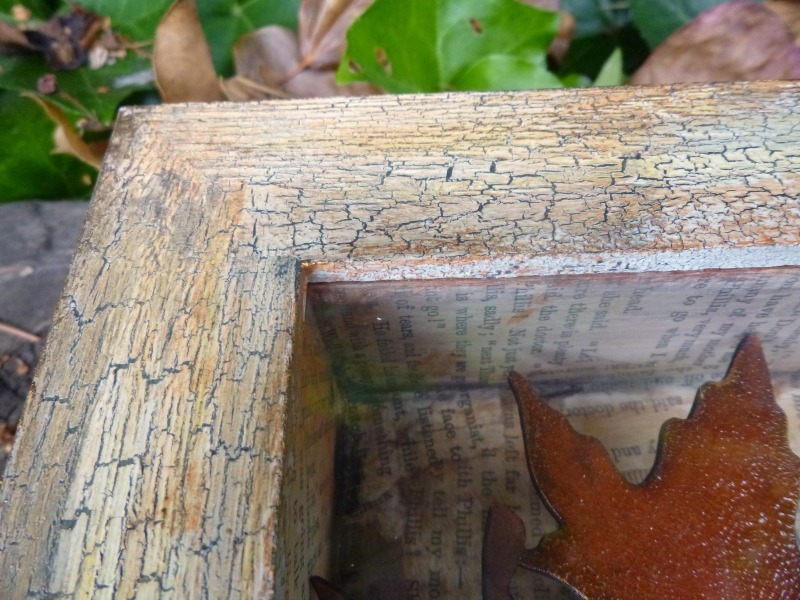 ), then crackle glaze, and then Chalk over the top. I applied Micro Glaze over the image, keeping it loose and rough so that it wouldn't be too perfect. 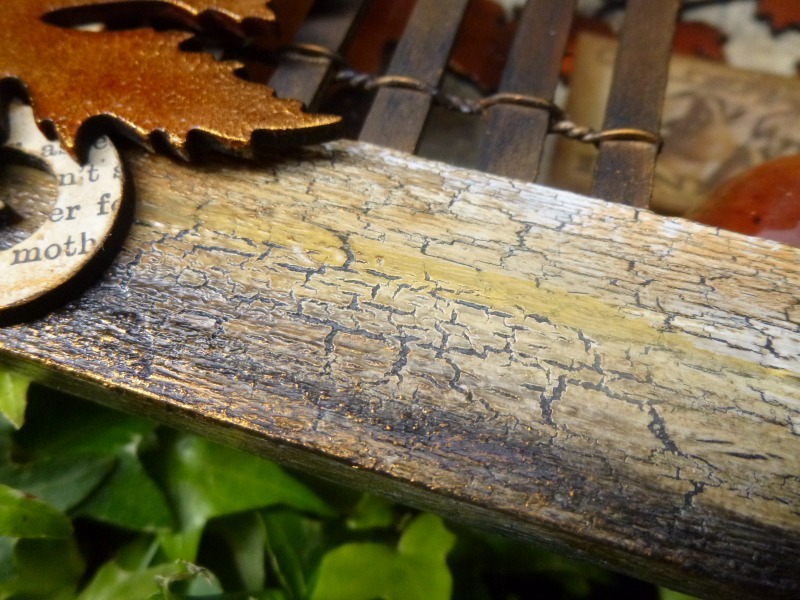 Then, with my heart slightly in my mouth, I smooshed the tag through some Ground Espresso, Pumice Stone and Hickory Smoke Distress Stains on the craft mat. I shouldn't have worried... the Micro Glaze did its job beautifully, preserving the image, while allowing the inks to pool and spot around it. I carried on with the wrinkle free distress technique, adding several more layers of inky dabbing and smooshing for a really grungy look. I love the collage effect of the Hot Picks image with these great numbers around the bulb of the flower. To add some more dimensional texture, I borrowed an idea from my recent Destination Inspiration post over at A Vintage Journey - the rusty textured floor from my spooky Victorian parlour room. 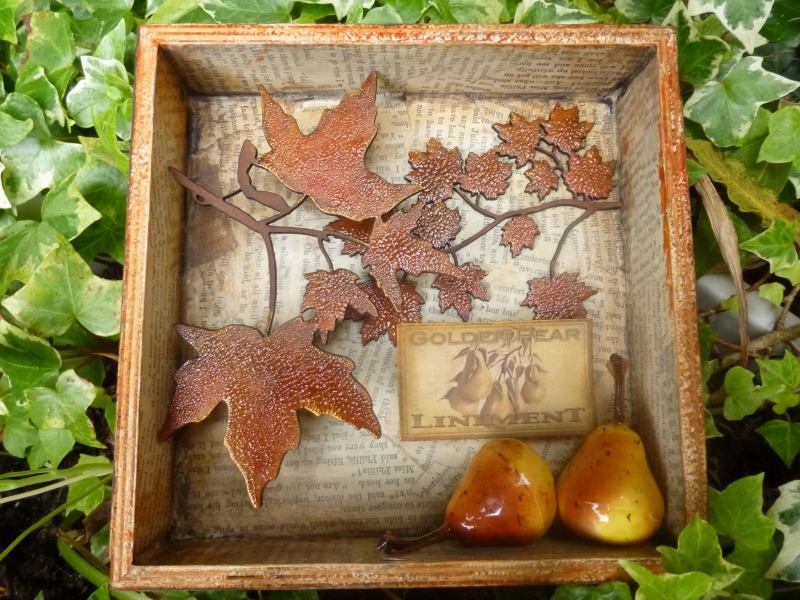 I ran some dark brown Kraft-Core through the BigShot with the Mixed Media Thinlits lattice die, and then added tiny sprinkles of Walnut Stain and Vintage Photo Distress embossing powders as well as a touch of Ranger Antiquities Rust powder. The words are from the Small Talk stickers. They were a bit of a self-pep-talk as I was really enjoying the dark grungy brown look, but wondering whether I ought to add a contrasting colour or element. I went looking for words while I debated, and these just leapt out at me. I took it as a sign that I should stick to my monochrome guns. ... and wrapped around the tag itself. Can't beat a bit of rusty texture! A tulip is, of course, a spring flower... but through the winter the bulb holds the blueprint deep in the earth, so this is like a ghostly echo of the flower which won't appear for many months yet. 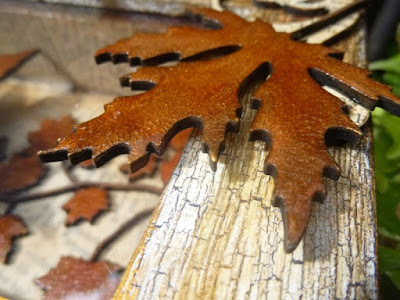 I hope you'll be inspired to Add Some Texture at Country View Challenges this month. 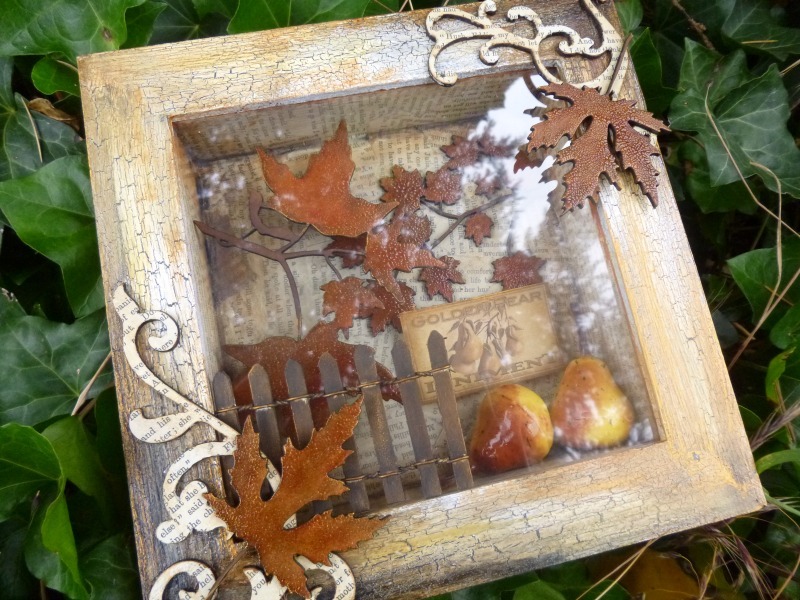 Come and play along and you'll be in with a chance at the randomly drawn prize voucher from Country View Crafts. I hope we'll see you there soon.